How Finns Make Sports Part Of Everyday Life : Shots - Health News In Finland, 90 percent of adults take part in sports or exercise at least twice a week. The Nordic nation far outpaces the U.S. in adult sports participation. Free and easy access to facilities helps. The sporting options in Finland are everywhere. 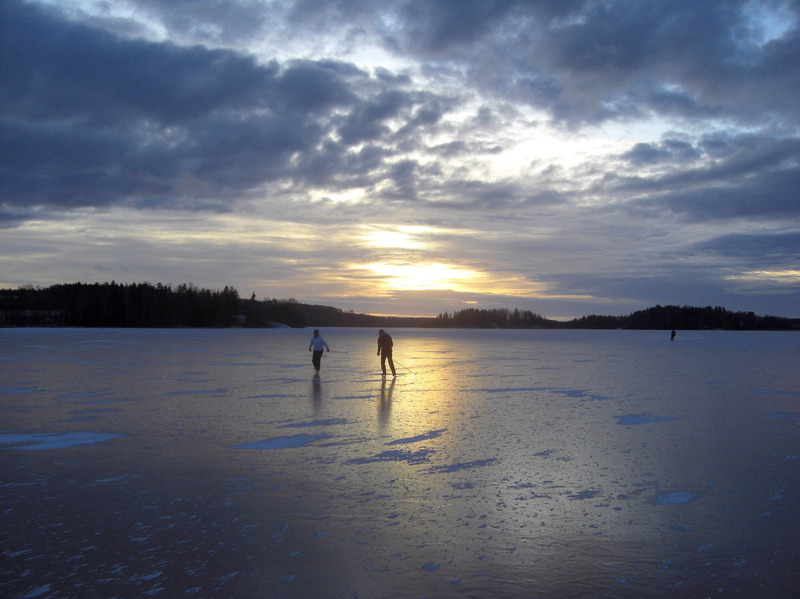 Here, two people take advantage of the ice on Lake Hiidenvesi to get some exercise. In Helsinki, sports facilities pop up all over the place, sometimes in some pretty odd nooks and crannies. One bomb shelter hosts an archery club, another an underground swimming pool and an ice hockey rink. Though they hardly need it, there's a national plan in Finland to get people to sit less. It reminds them, in fact, that, "Under the Constitution ... physical activity is a basic cultural right." "It's been kind of a social right to provide citizens with sporting possibilities," says Hanna Vehmas, a sports scientist at the University of Jyväskylä. She says it's a Nordic thing to consider sports a social right. That thinking started in the 1970s, when governments started subsidizing sports gyms in even the smallest towns. Now, she says, "there's an estimate of some close to 30,000 sports facilities in this country, which is said to be more per capita than in any other country in the world." Those facilities are one reason why Finland and its Nordic neighbors always make the top-five list of most physically active European countries, according to surveys by the European Commission. These days, municipalities spend about $700 million a year subsidizing sports facilities and clubs. A portion of lottery funds also goes toward funding sports facilities and research. Walkways and bike paths snake through the cities. Public swimming pools are busy year round, even above the Arctic Circle. And during the cold, dark winters, cross-country skiers cut tracks in the snow through parks, across the solid lakes, even on the frozen Baltic Sea. "Here you can more or less just step out of your door and go," Vehmas says. Finns do just that. Half of women, and a third of men, say they bike to work. About a fifth of the country belongs to sports clubs or federations. Some people even play sports at work. 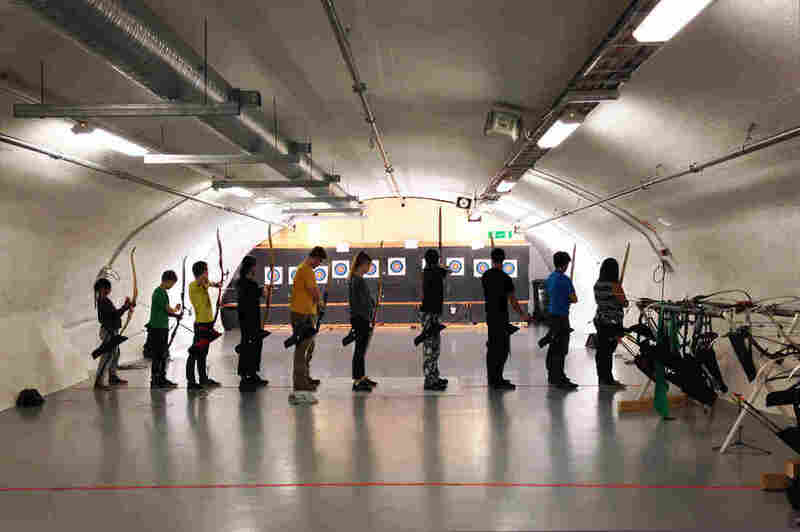 A Helsinki bomb shelter now serves as a shooting range for an archery club. A poll by NPR, the Robert Wood Johnson Foundation and the Harvard T.H. Chan School of Public Health found there's a gender gap when it comes to sports in adulthood in the U.S. Men are more than twice as likely as women (35 percent to 16 percent) to say they play sports. Every Wednesday morning, a group of scientists at the Finnish Meteorological Institute and the University of Helsinki ditch their desks to play "futsal," an indoor form of soccer, in a gym across the street. It's one of the most popular team sports in the country, along with floor hockey and Finnish baseball. The bosses of these meteorologists and computer scientists encourage them to play sports on the clock for an hour a week. "My own boss plays badminton, floorball and futsal. And his boss also plays futsal," says Mika Heiskanen of the Finnish Meteorological Institute. When it comes to employee fitness, these employers are hardly exceptional in Finland. The postal service has orienteering and riflery teams. A nearby chocolate factory has a gym and offers aerobics classes. And, Heiskanen says, he and his teammates regularly take on other government agencies, like customs officials and police units. Ossi Aura, who specializes in occupational health care at the health care company Terveystalo, says the trend of employers encouraging sports participation started about a century ago with the forestry industry. "Nowadays, 90 percent of employers support their employees' physical activity in some way," he explains. Each year, Finnish employers spend an average of about 200 euros per employee for physical activity, or about $220. The money goes to anything from gym vouchers to providing workout facilities and saunas. Even factories offer such services. "Yes, in fact, they have their locker rooms, they have their showers, they have their saunas, based on the ancient agreements between workers' unions," says Aura. Today, one reason employers tend to support their employees' physical activity is because of a tax break. Businesses can deduct money spent on employees' physical well-being, which includes promoting sports and exercise. 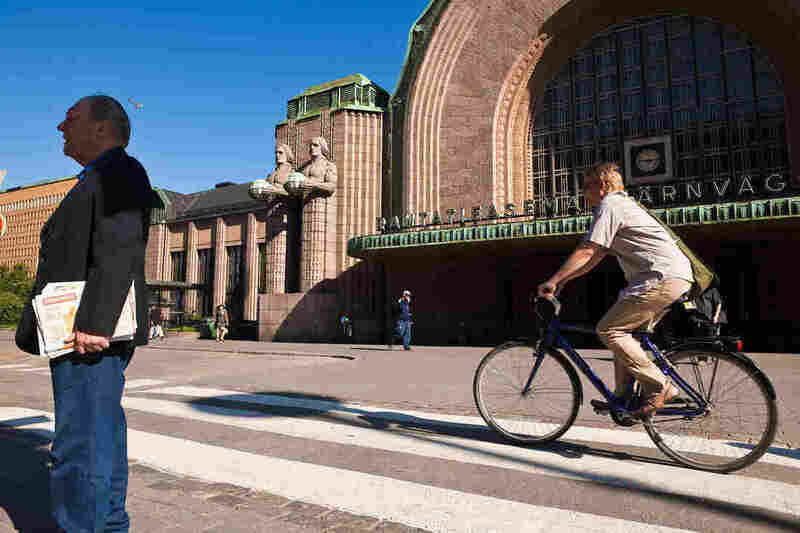 A man bikes past the Central Station in downtown Helsinki. But there's something else. "We have a lot of research showing that investing in work well-being will bring back as much as six times" the money invested, says Matleena Livson of the Finnish Sports Confederation. "Because you reduce sick leaves, you improve the cohesiveness and good spirit, and you improve employer image at the workplace." Livson and Aura say it's understood in Finland and other Nordic countries that healthy employees do better work. They also don't have as many sick days. And staying fit, especially by playing sports together, could help build company cohesion and loyalty. "And that's actually even more important than the health side," says Aura. Physically active people also save the health care system a lot of money. According to a calculator devised by the World Health Organization, the Finnish Ministry of Social Affairs & Health estimates that people who bike and walk save the health care system as much as 5 billion euros, or about $5.5 billion, each year. But state subsidies are now being cut in Finland. The University of Jyväskylä's Hanna Vehmas says sports funding is taking a hit. "The private sector has become more responsible for providing sports supply," she says. "Sports participation is more than before becoming a commodity, something that you need to buy. And then people can afford it or they cannot afford it."